Fives develops, manufactures and installs its proprietary AdvanTek® combustion systems for reheating furnaces and strip processing line furnaces that give steelmakers optimum combustion control, from capacity to flame length to fuel choice, and the lowest NOx emissions. Manufactured and tested in Fives’ facility in Bar-le-Duc, France, the AdvanTek® burners are designed and supplied following rigorous quality processes that have been under continuous improvement for more than 40 years. AdvanTek® CWF (Central Wide Flame) and MWF (Modulating Wide Flame) burners improve the crosswise and lengthways temperature profiles of the products in the reheating furnace. 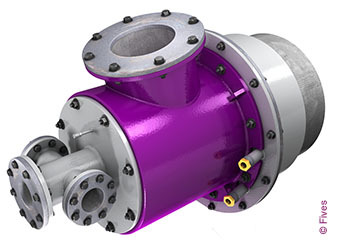 They are designed to drastically reduce NOx emissions and energy consumption and can be fired with most of the fuels available to steel plants with great flexibility. These burners are installed in the roof of furnaces operated with temperatures up to 1400°C. Combustion air is introduced at high velocity through tangential ports inducing a high swirling moment. This, together with the special quarl design, results in a flat flame developing all around the quarl, perpendicular to the burner axis. They are located in all longitudinally fired zones, either on the top and/or bottom of the reheating furnace. For each burner the geometry as well as the air and fuel injection velocities are adapted to the geometry of the combustion chamber to obtain the optimum flame-to-load heat distribution. These burners were developed to imitate the even radiative heat transfer characteristics that can be obtained from flat flame roof burners but have the added advantage that it is much easier to vary the heat transfer over the width of the furnace by adjusting the flame length. They are located in the side walls, either on the top and/or bottom of the reheating furnace, and have been specially designed for Stein Digit@l Furnace® operation. 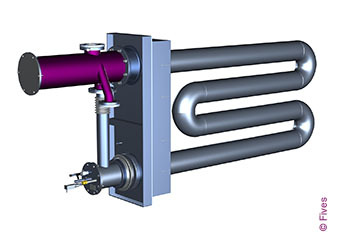 AdvanTek® radiant tube burners (WRT and URT) for annealing and galvanizing lines are the best available technology considering burner capacity, reliability, consumption ratio and NOx emissions. The new burner generation, AdvanTek® WRT 2.0, uses basic oxygen furnace (BOF) gas, which is low heating value gas. A number of tests conducted at Fives’ Bar-Le-Duc test centre in France demonstrated an optimum combustion efficiency with 71% efficiency for BOF gas with NOx less than 50 mg/Nm3 at 3% O2. The combustion efficiency could reach 76% with natural gas. The AdvanTek® WRT 2.0 burners are available for a power range of 100 - 180 kW.